GF-4, Dynamic House, Besides HDFC Bank, Near Vijay Cross Roads,, Ahmedabad, India 380009. Entry fee: Rs 100 and A smile on your face. Feel free to bring your friends along. 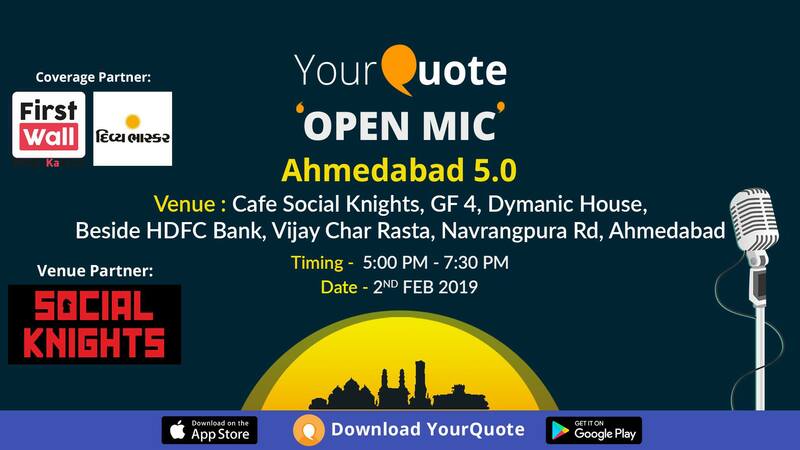 We are super happy to announce that Yourquote brings it’s 5th Open Mic in the city! And if you are happy to know this too, please fill this tiny form and participate in the event. Note: Kindly pay the fee once you receive the confirmation mail via PayTM, Google Pay, WhatsApp Money at 99250 11486. You are allowed to perform one original piece (poetry/shayari/storytelling/standupcomedy/slampoetry, etc), for not more than 5 minutes. All the performances will be recorded and put on YourQuote’s YouTube channel for Open Mics (Link: bit.ly/YQOpenMic). Please download YourQuote app (Link: bit.ly/Yourquoteapp) before registering.